With access to outmoded technology, the steadfastness of a marathon runner, and the skills of an electronics engineer, you too can turn a VCR into an automatic pet feeder! Remember back when successfully programming the VCR felt like a minor triumph? 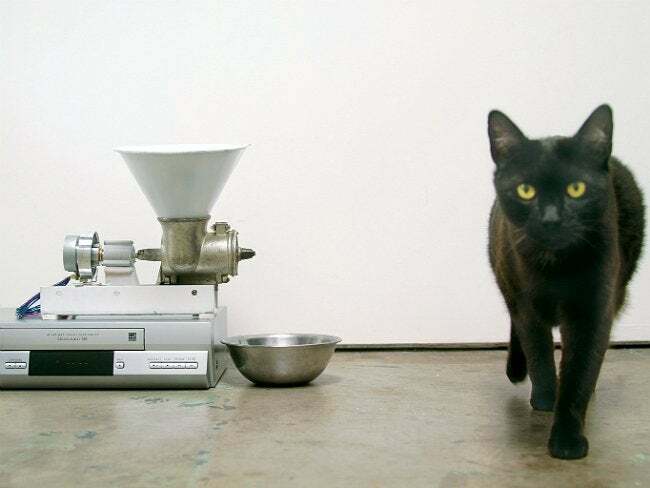 Now imagine how James Larssen of Make must feel: He actually figured out how to use the timing mechanism within an old VCR to solve a frustrating, everyday problem: We can’t always be home at the times when our beloved pets are accustomed to eating. Rather than set the machine to record a favorite show, Larssen configures it to activate a pet-feeding contraption of his own devising. Genius! An electronics engineer by trade, Larssen began, in true engineer form, by taking everything apart. With the internal components of the VCR revealed, he located the video head drum and removed it, along with the drum’s motor. Next, Larssen hooked up that motor to something he had lying around his workshop—a gearbox. The gearbox, in turn, connected to an auger Larssen had salvaged from an old meat grinder. It’s all coming together! In the next to last step, using bolts and plenty of glue, Larssen secured the assembly to the top of his covered VCR. And for the finishing touch, he slid a lidded funnel into the open top of the auger. Before leaving the house, Larssen can load the funnel with dry pet food and set the VCR to “record”—that is, dispense the food—at a specific time of day. Though everyone may not share the engineer’s gift for reinventing old technology, his fascinating tutorial reveals how Larssen managed to pull off something so inventive.